In the year 686, a terrible plague swept through the monastery of Jarrow in eastern England. 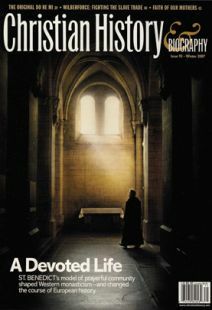 The population was decimated, leaving only two people to sing the daily prayers: the Anglo-Saxon abbot Ceolfrith and a young lad who had been dedicated to the monastic life. Tradition suggests that the boy who sang the Gloria with such passion was Bede, who would grow up to be one of the finest historians of the early Middle Ages. All Bede knew was the life of a monk. At age seven, his parents sent him to the monastery of Wearmouth, and soon thereafter to its sister monastery at Jarrow, where he remained for nearly all of his 62 years. Bede was ordained a priest at age 30, but his reputation was established not by his work as a cleric, but as a scholar monk. His prodigious scholarship included biblical commentaries, observations on nature, and hagiographies. His most famous work was his Ecclesiastical History of the English People. Bede's History is not a bland recitation of facts and dates but a lively creation with a specific agenda: to demonstrate the orthodoxy of the English people. So Bede lauded the saints and heroes of England, from the earliest martyr to the Anglo-Saxon kings. He was at his most colorful when discussing Celtic Christians, who celebrated Easter on the wrong Sunday each year and cut their hair in scandalous ways! But for all of his criticism, Bede clearly had a grudging respect for the doughty Celts with their unique version of Christianity. Bede died in 735 in his monastery's chapel, singing the Gloria as he had so many years before as a small boy. In time, the pope would declare him a Doctor of the Church, bestowing upon him the title we use to this day: the Venerable Bede. Many Catholics and Protestants are looking back to Benedict for the community and spiritual intensity they can't find in modern culture.